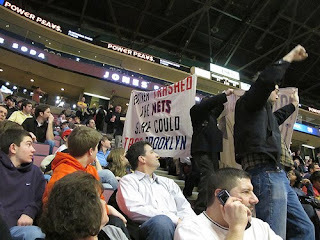 Apparently there was a little protest at the Nets-Pacers game last night at the Izod Center, as eight Atlantic Yards opponents unfurled a banner that read, "Ratner trashed the Nets so he could trash Brooklyn." A group of eight protestors led by Daniel Goldstein, who has led the fight against the development of the Atlantic Yards project in Brooklyn, hoisted anti-Bruce Ratner banners last night that were confiscated by Meadowlands security. The protestors stayed in their seats, no doubt wishing they were ejected. Watching the Nets is almost inhumane punishment. What's a four-letter word for garbage? Junk? Nope. Slop? Not here. Go with "N-E-T-S, Nets, Nets, Nets." Neither did arena security guards, who confiscated a pair of protest banners that were being paraded through a lower section. The banners ripped Nets owner Bruce Ratner, who is moving the team to Brooklyn as the centerpiece of his Atlantic Yards project, and pleaded with Nets fans in New Jersey to pull for the team to remain in the Garden State. Scott Turner, one of the protesters, said the group chanted "Jersey yes! Ratner no!" as it held the banners up late in the first quarter. As a security guard tried to take one of the banners away, he told Turner that if he didn't surrender it, "we will call the state police."